If Pasta, Pizza and plenty of other delicious dishes are the order of the day, then these top Italian restaurants are the places to go. Run by well known and hugely popular chef Rosario Sartore, who brings his family’s cooking all the way from Naples to this homely little restaurant on Dalry Road. Well known for its seafood, this authentic Neapolitan eatery is immensely popular with locals and visitors alike. With huge portions and a straight forward and honest approach to Neapolitan dishes, you’ll find it is one of the best restaurants in town, never mind just for Italian cuisine. This small pizzeria on Rose Street is already making a big name for itself by selling some of the best pizza available in Edinburgh (which is no mean feat). Perhaps most interestingly, Dough is the first Scottish pizzeria to use Seawater Pizza-Dough, this futuristic concept is already hugely popular in Naples and considered to make the dough lighter and easier to digest. A fantastic concept all round, pizza as street food means you can sit down outside and enjoy one of a selection of 15 inch pizzas or simply pick up a slice (for just £3) and wander off down Rose Street and have a nibble in the sunshine. There is also the lunchtime menu from 12pm until 3pm wherein you can buy a ten inch pizza for half the price of its 15 inch counterpart. In other words, you’ll get great pizza and great value. If you head to picturesque Newhaven, you can indulge in beautiful Italian cuisine while watching the tide roll in at Sasso (named for the Italian word for rock, stone or pebble). Opened in 2016, it boasts a relaxed environment and reasonable pricing for quality food. All of the usual suspects in traditional Italian cooking such as sun- blushed tomatoes, goats cheese and mozzarella make an appearance but it’s in combing them with fresh Scottish ingredients like shetland mussels and Scotch beef that it really comes into its own. There’s an extensive menu that’s likely to have you coming back for a second visit. Another Rose street residence, Veeno: The Italian wine café is an opulent, contemporary bistro that serves some excellent, traditional boards of spuntini (little snacks and appetisers). They also have an excellent array of cheeses, cured meats and of course as you would expect, wines. A far more casual dining affair, but sometimes exactly what’s needed after a hard day of work. 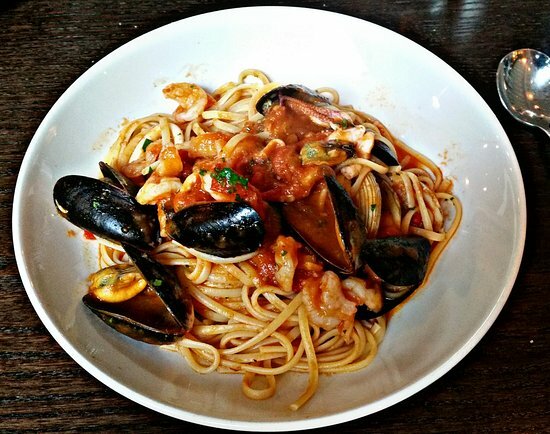 Situated in Shandwick Place is one of Edinburgh’s most highly acclaimed purveyors of fine Italian dining. This is a classic Italian restaurant, that’s perfected both its service and food offering to the point that you’d find it hard to imagine anyone not enjoying themselves here. The menu is huge and covers all corners of the Italian culinary map, with their pastas and pizzas considered to be some of the best in the city. They also have a quaint little sun terrace which, during sunnier days, is perfect for people watching as you enjoy a little al fresco dining. Located on Morningside road, Nonna’s Kitchen is a homely, warm, atmospheric restaurant with a large menu brimming with Sicilian culinary flare. This family-run establishment has been well-loved by locals and visitors alike ever since it first opened its doors seven years ago. With Gino and mum Carmela on hand to welcome guests in and Father Mimmo in the kitchen cooking up delights, it’s easy to see why people are always happy to come back and the family have been so successful in their forty years in Edinburgh’s restaurant scene. While pasta, meat dishes and pizza all feature heavily on the menu it’s in the seafood (pesce) section and specials board you’ll find the real gems. Located on Lothian road, Frizzante is one of the stand-outs on the busy West End Street. Priding itself on quality Mediterranean & Neapolitan cuisine, this chic little restaurant also offers a wide range of options for celiacs and vegetarians. A nice relaxed ambiance, friendly staff and steeped in history, Frizzante is a must if you’re in the vicinity. With dishes as pretty as the butterfly that gives this place its name, Papilio can be found on Bruntsfield Place, and is a popular spot for fans of Italian cuisine. With an extensive menu to cater to all palates, and a roster of friendly, efficient staff who will accommodate you however they can, its interior is intimate and cosy, well suited to couples, families or groups of friends out for a meal. With excellent service and a menu which is vast and inexpensive, there really isn’t anything not to like.